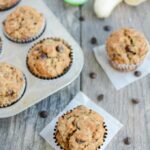 These dairy-free Coconut Oil Banana Muffins are packed with flavor and perfect for breakfast or a quick snack. Combine coconut oil and peanut butter in a large bowl. Microwave, stirring often, until coconut oil is melted. Add maple syrup, almond milk, eggs, vanilla and banana and mix well. Pour into 12 lined muffin tins (they’ll be very full). Bake at 375 degrees F for 22 minutes.